I don’t know what it is about ice creams. When I see a new flavour in the store I get excited and must buy it. I saw almond kulfi which I have had in the past and love. 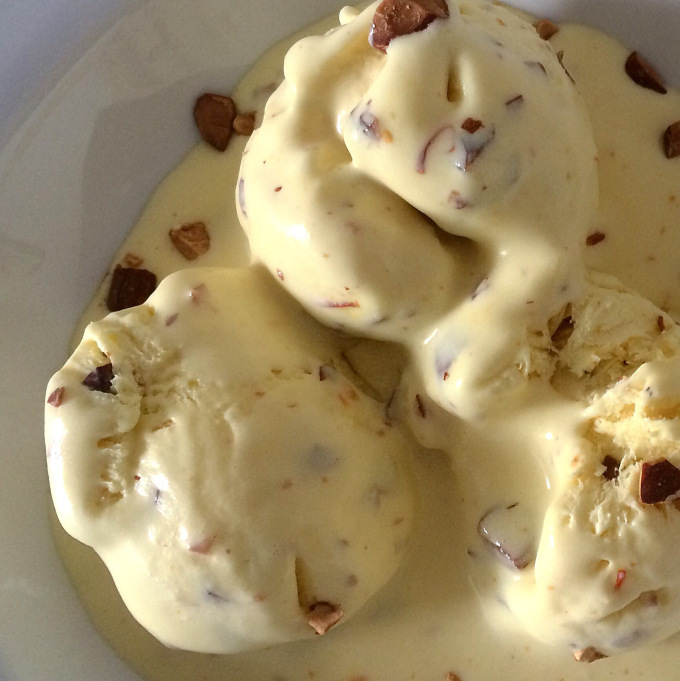 It’s an Indian style ice cream flavoured with almonds, saffron, cardamons, and sometimes pistachios. I knew I had to try it. Sadly, I was very disappointed, it was freezer burned, so I ended up returning it. But the taste was disappointing as well. It had an artificial flavour and when I checked out the ingredients it made sense. Lots of colouring and preservatives. So I of course, decided to make my own. In a small pot, bring the almond milk to boil. Reduce to a simmer and add the saffron, cardamon, and salt. Simmer for 30 minutes. Let cool. Remove the cardamon pods. In a bowl, add condensed milk, vanilla, almond extract, and cooled almond milk. Mix on low speed. Slowly add the cold whipping cream and mix on high until soft peaks form. Fold in chopped almonds. Put in a freezable container with lid. Freeze for at least 4 hours. Let soften for 10 minutes before serving.